Moving on into the 1930’s, the Sioux are now on the Fort Peck Indian Reservation in Montana. Two hard drinking natives are struck down by what appears to be the gleaming ghost of Colonel Custer himself! Meanwhile, Captain Hazzard is testing a new rocket-pack and stopping bank robbers. At Eastgate Collage, Azela O’Hare, the lovely Eurasian beauty who is in love with Captain Hazzard, helps a fellow student; Princess Dancing Moon of the Sioux tribe escape from would be kidnappers. Dancing Moon says she has been told to seek out Jim Anthony, since this adventurer has Native American Blood. Azela goes with her to Captain Hazzard, who will take them to Jim Anthony at his headquarters, the Waldorf Anthony Hotel. 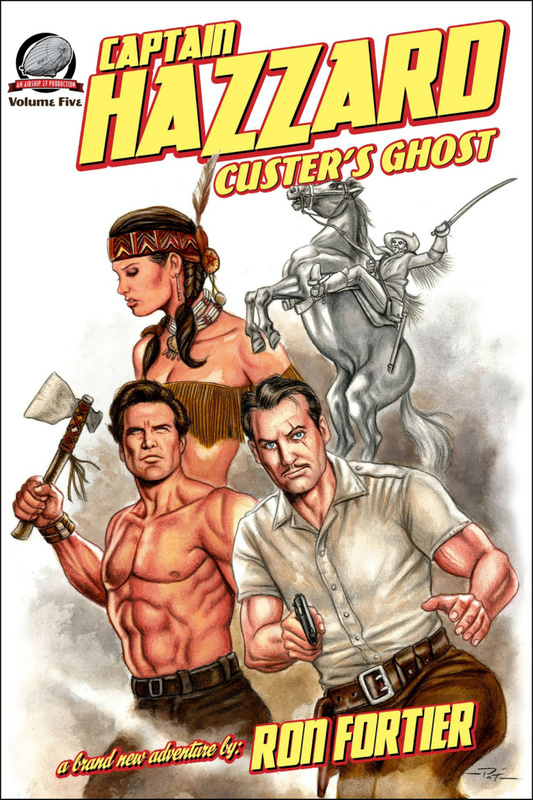 This book is a credit to both Captain Hazzard and crew and Jim Anthony, Super Detective! The two heroes play off each other with dexterity that somehow makes both of them shine! Hazzard is a man of science, but willing to expand his horizons when faced by the supernatural. JimAnthony is also a scientist, but he is in strong connection to his Comanche roots. His grandfather, old Mephito, is a shaman of his people and often has visions that warn Anthony of dangers. The ghost of Custer and the Skinwalkers appear to be in cahoots with each other. The question is why. All of the silver and copper mines in the area have been abandoned when the ore gave out. What secrets are the bad guys hiding, and can Hazzard and Jim Anthony stop creatures that appear to be impossible? Captain Ron serves up another delicious delicacy from Airship 27! Spicy and filled with plenty of pulp action; it will be a wonderful read for all who love the larger than life heroes of the old pulp magazines!